I created this little video on my iPad using the Brushes app, which captures a stroke-by-stroke animation as you draw. I am sending this out to wish everyone health and happiness in 2015. Here's another photo that I took during last weekend's excursion to Lynch Park, here in Beverly, MA. This park is surrounded by water on three sides. We walked along the path that lines the edge of the park, overlooking the rocks in the water below. I took this picture by leaning over the chain-link fence, looking straight down at the ocean. Today I drove down to Boston to Galatea Fine Art Gallery. I was picking up my paintings from the Smaller Works Show, and sticking around to help hang the new show going up this week. It was fun to get a preview of the new art (which is amazing) and to get to know some of the other artists. Before I left for home, I decided to take a picture of this view from the window of the gallery. 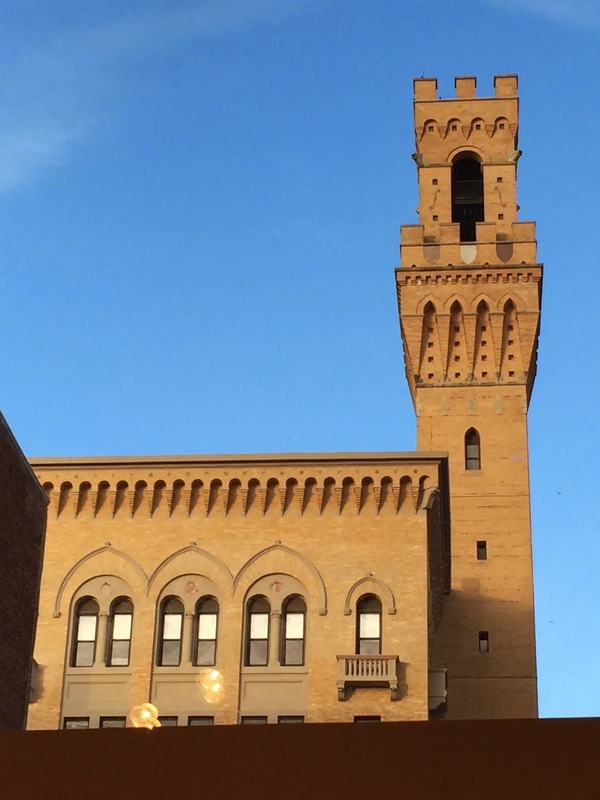 This lovely Italianate tower is part of the Pine Street Inn that serves the homeless in Boston. I always enjoy looking at it, and this faithful landmark has helped me find my way to Galatea more than once! I didn't intend to make jewelry this morning. 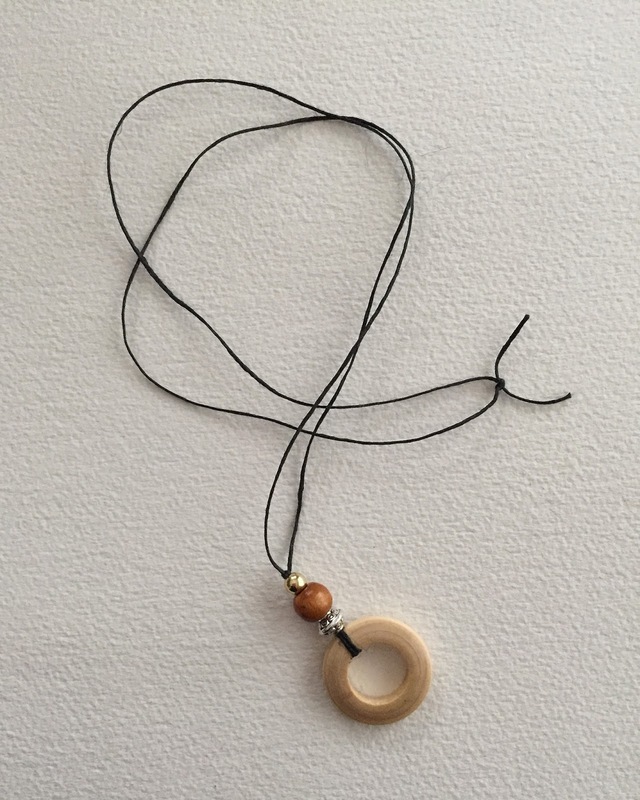 I was trying to straighten up and organize my beads, but I came across a necklace that I had started to make, just a wooden circle on a piece of cotton cord. I decided to finish it. After some trial and error, I decided on another wooden bead, plus metallic accents in silver and gold. Temperatures were in the fifties today and it felt more like spring than December. We took the dog for a walk in Lynch Park this afternoon, an oceanside park in Beverly, MA. I took a lot of pictures, but this is one of the best: the entrance to the walled rose garden. 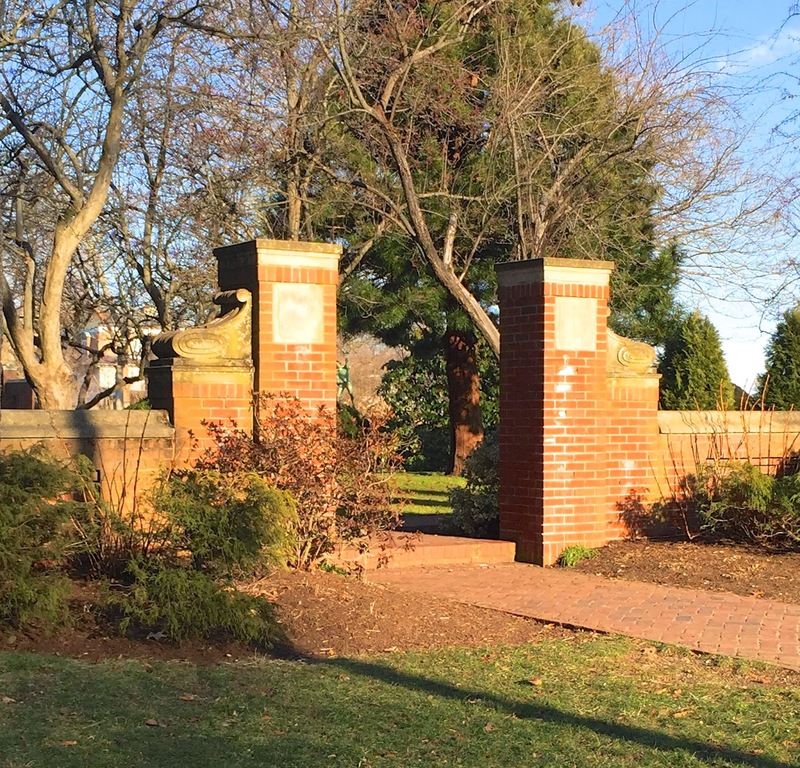 (The brick wall outlines the rose garden, but also occupies the space of the former vacation home of President William Taft.) The rose garden is just steps from the ocean, a park within the park. 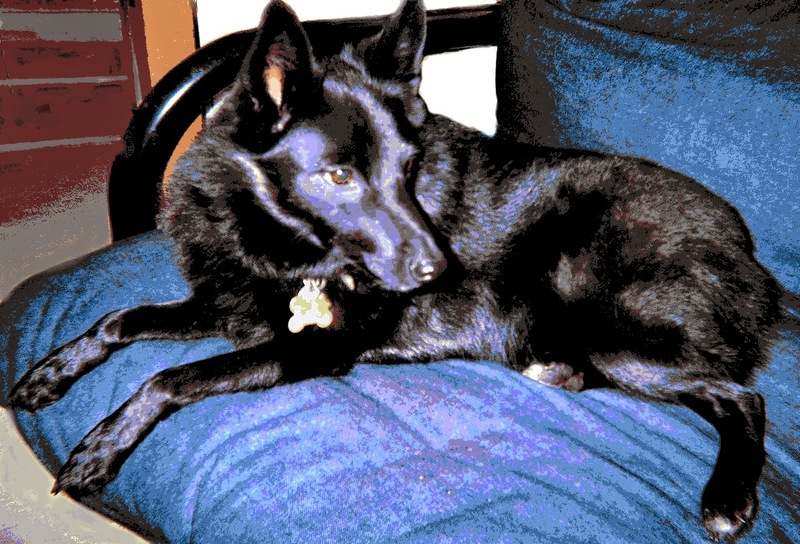 Tonight I edited the original image in iPhoto. I adjusted the light for a softer look and then cropped the photo to get this composition. 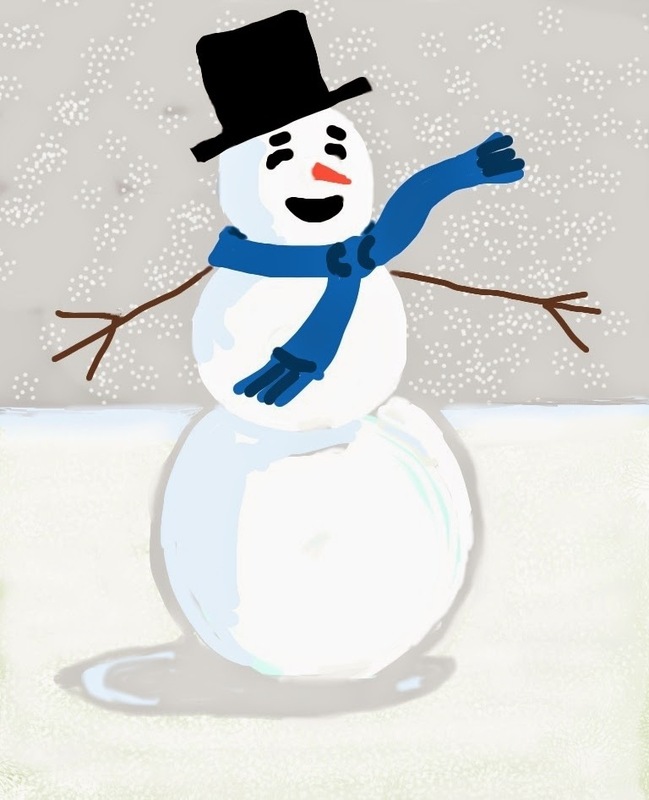 I drew a picture of a snowman tonight, using the Brushes app on my iPad. As you draw, the Brushes app captures a stroke-by-stroke animation, which is how I was able to create this little video. I plan to post the drawing tomorrow, but meanwhile, here is a little video. Just press play to make a snowman smile. 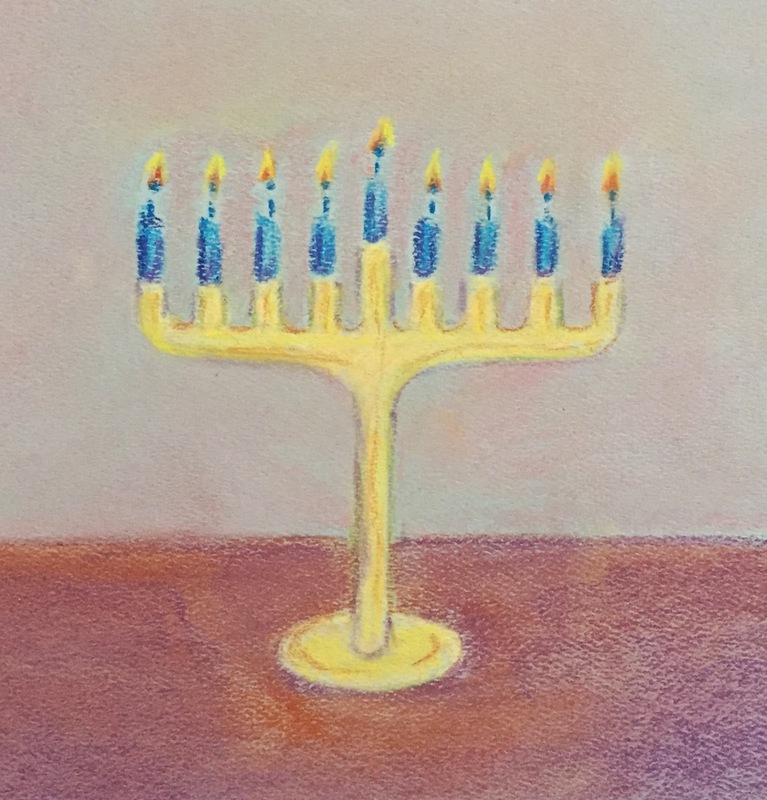 This is menorah number eight for the eighth night of Hanukah. I have been thinking about this one for a few days, and finally put it together. This is iron-on appliqué. Because I was pressed for time (pardon the pun), I used material leftover from another project and put this together on the ironing board. Well, sometimes you have to make a holiday with what you have on hand. I am happy with the design, and but I may make versions of this with different colors, which is easy to do on the computer. But for now, I like the off-kilter color scheme and the home-made look. I decided to call it "heimische" (homelike) menorah. 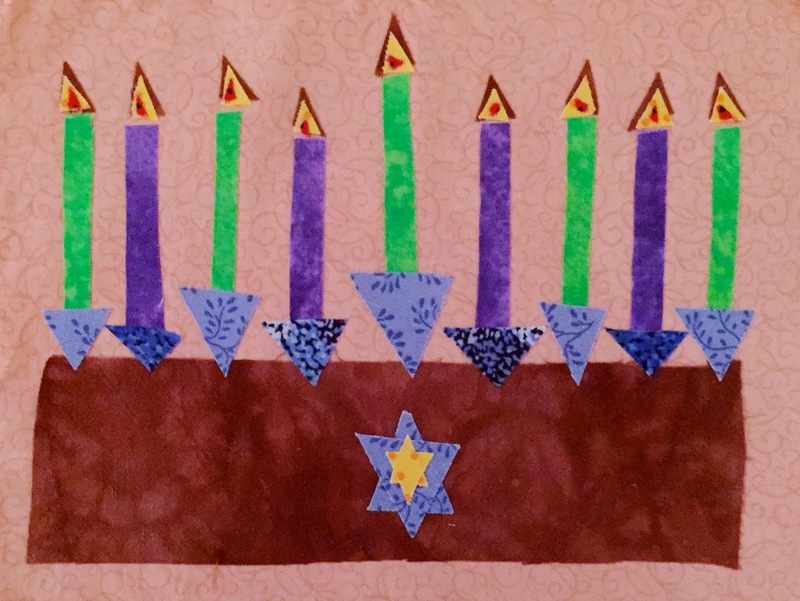 Here's my seventh little menorah for the seventh day of Chanukah. I drew this little sketch a couple of days ago, using colored conte crayon on paper. For the past few days, I have been making a menorah every day. 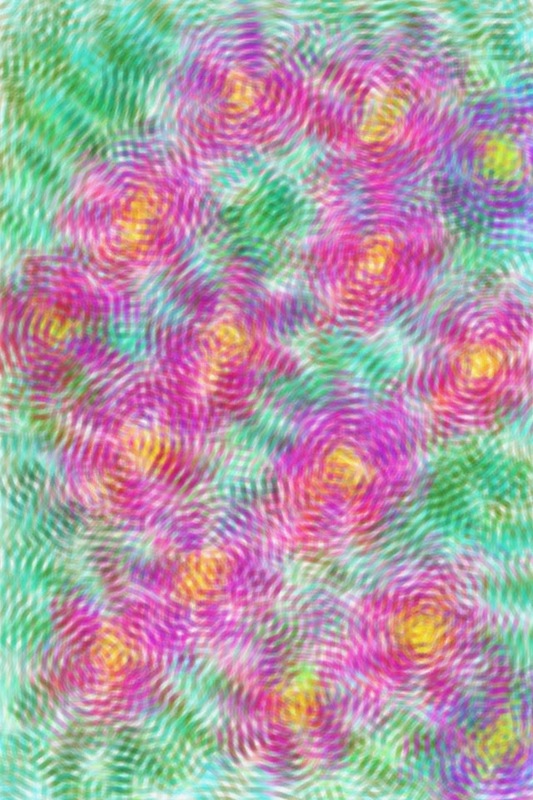 This one was made on my with Brushes app, but on the iPad which has the option of capturing a stroke-by-stroke animation as you draw. So you can press play and light the candles. 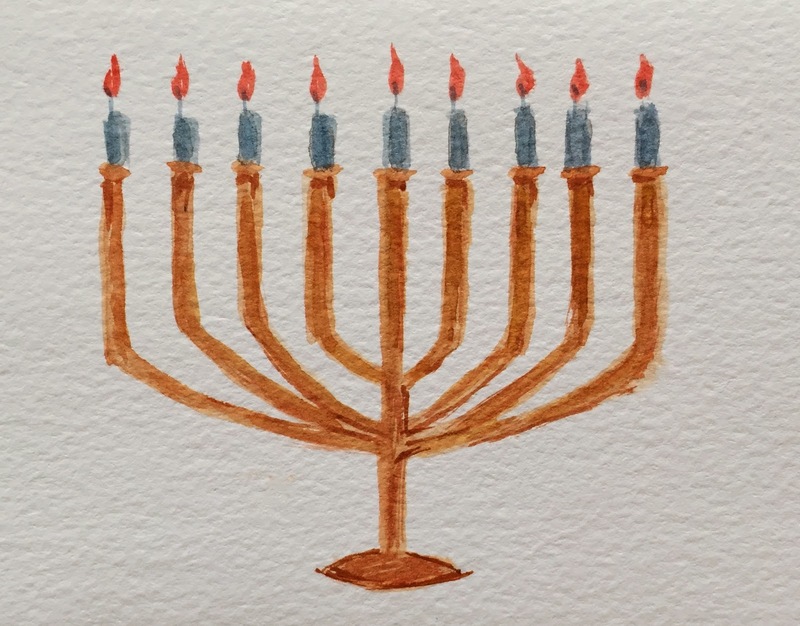 This morning I painted this watercolor sketch of a menorah. This is painted on a watercolor paper postcard (original size about 3 x 5 inches), and cropped to get a square format. I used my travel watercolor kit and a small brush. 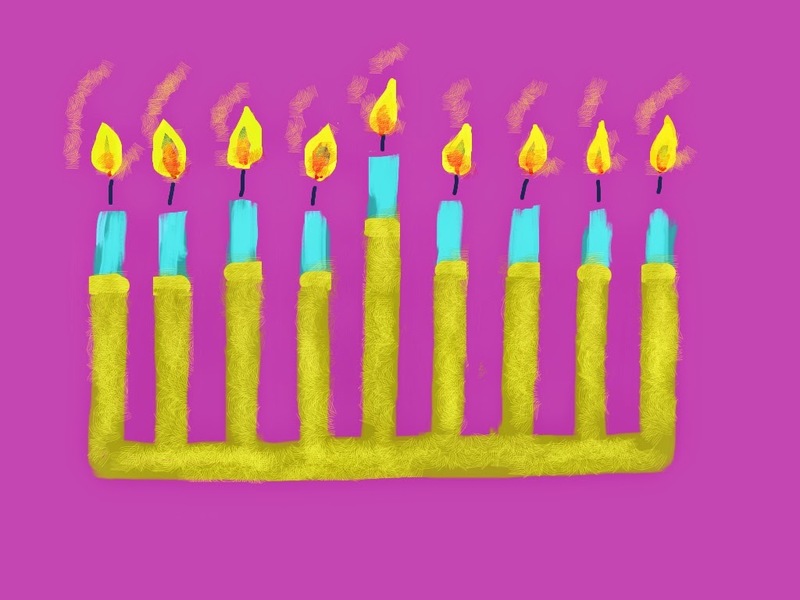 Another day, another menorah. This is a small drawing that I did today with pen and ink. This is 3 inches x 3 inches. 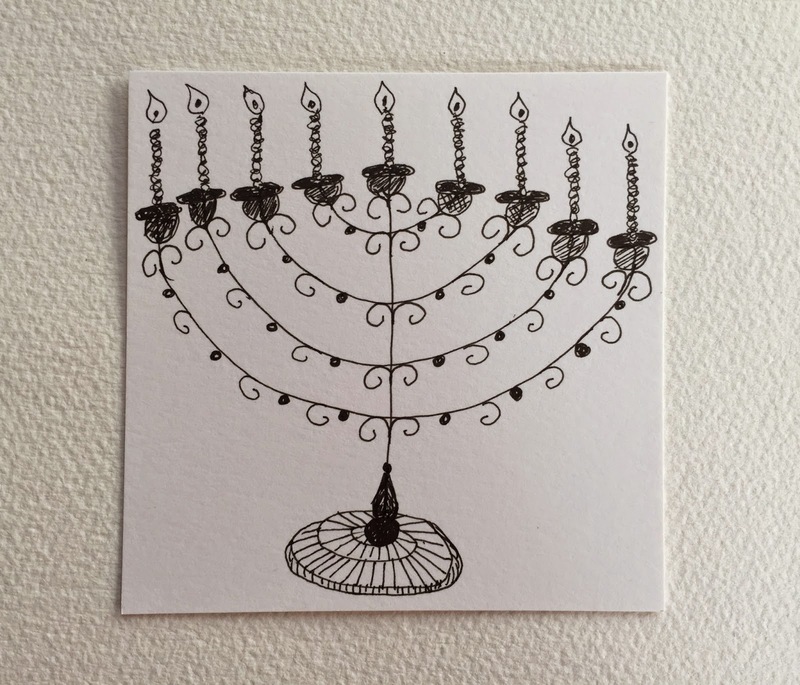 Here's another little menorah for the second night of Chanukah. 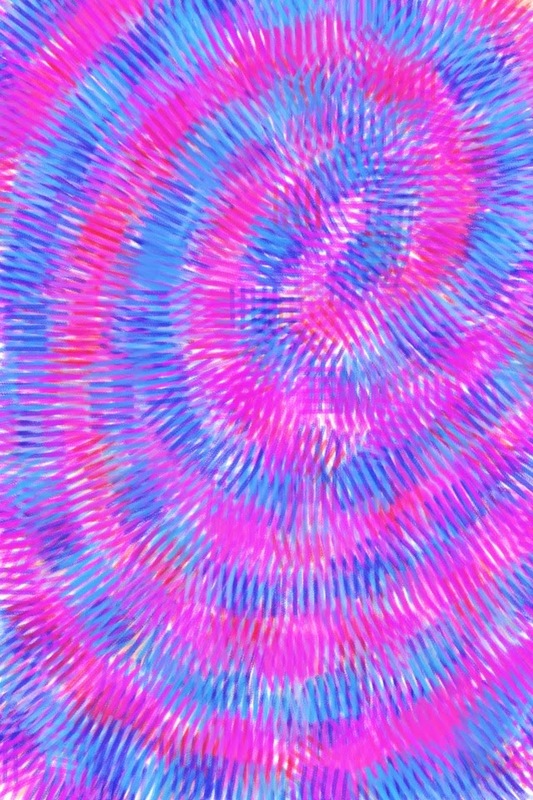 I made this tonight on my iPhone with the Brushes app. It has been a very busy day, but this afternoon I made a little time for art. 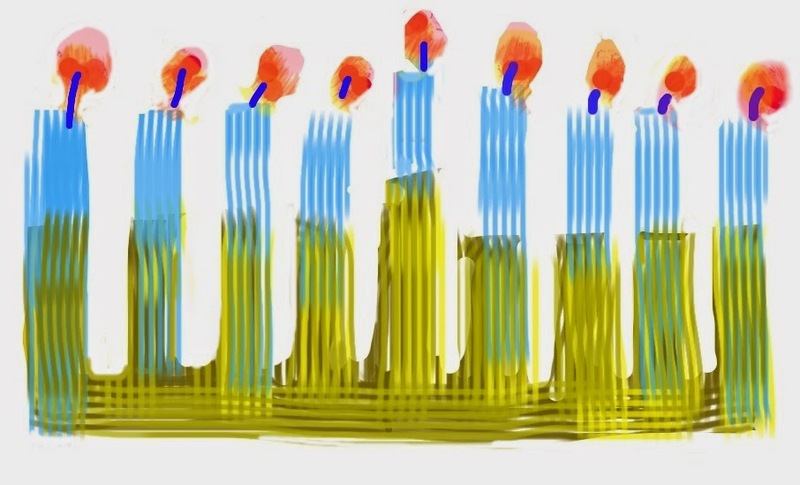 I used the Brushes app on my iPhone to make this little digital sketch of a menorah. Then I transferred it into the computer, cropped it in iPhoto, and used Painter to do some basic cleanup. 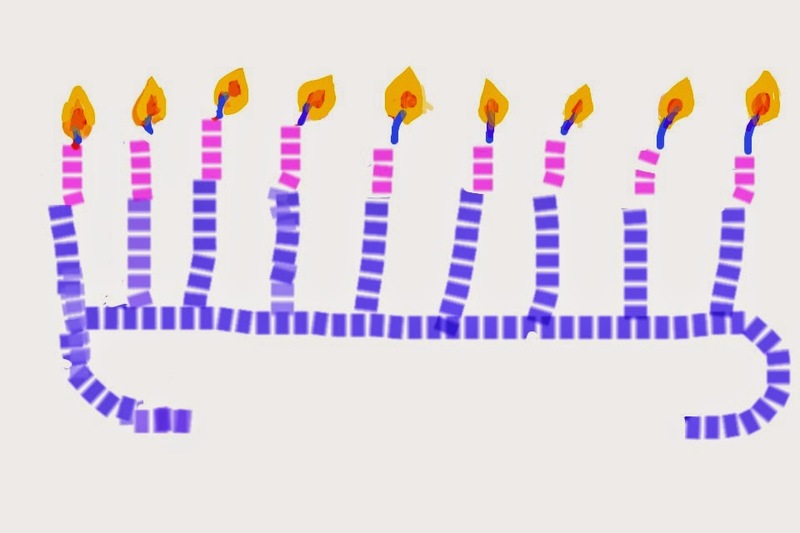 Tonight is just the first night of Chanukah, but I drew this menorah with all eight candles blazing. Here's another little composition that I created today, using the Brushes app on my iPhone. 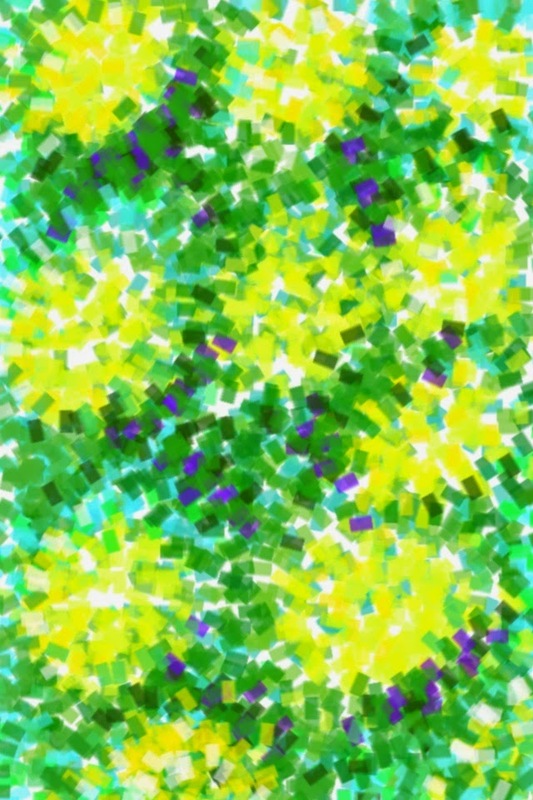 It's fun to experiment with the different "brush strokes". I discovered that this one creates petals if you use a circular motion. Yesterday while I was at Porter Mill, I wanted to show a friend the Brushes app on my iPhone, so I started a new drawing to demonstrate how it works. The little drawing I started was no more than a green squiggle, but today I decided to finish it. This drawing began as a geometric design, but it started to turn into yellow flowers, so I let it happen. 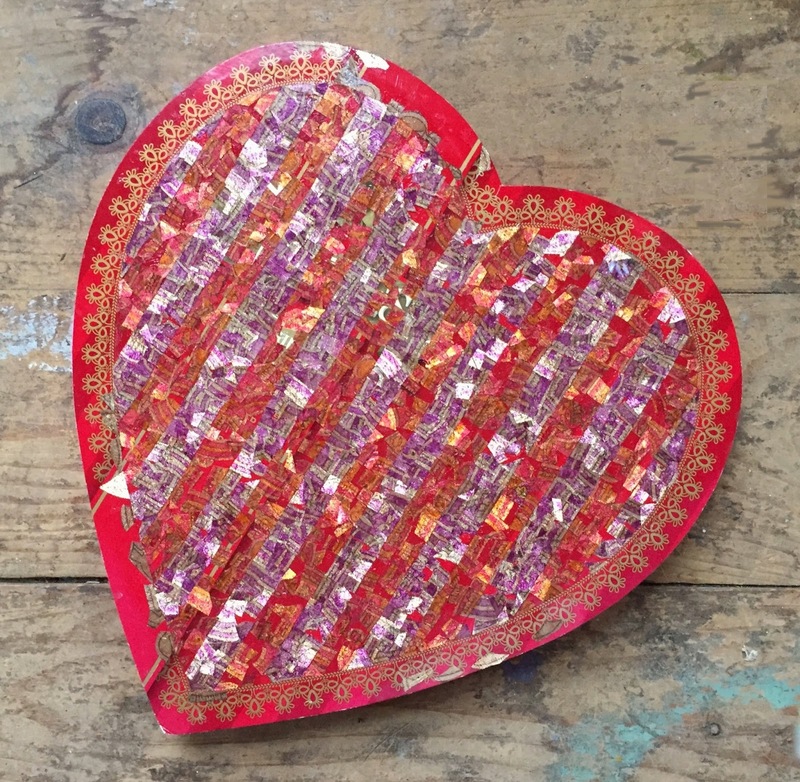 Today was Open Studios at Porter Mill and I was in the studio most of the day. I started this drawing on my iPhone using the Brushes app, and worked on it a little bit at a time, when ever I had a few minutes between visitors. I think that way of working was an advantage as I created layers of colors. I think I might use this as an image in Zazzle. It might make a good smart phone case. I have been making jewelry for the last week or so, getting ready for Open Studios at Porter Mill (coming right up on December 13). 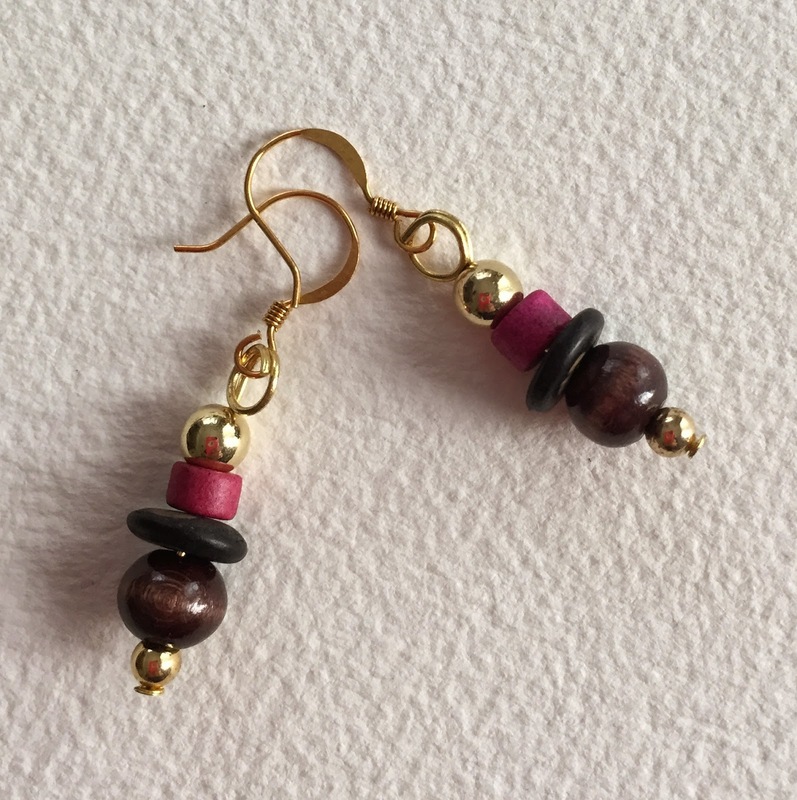 I made another pair of earrings this morning with wooden beads in black, brown, and pink (framed by gold metallic accents). I have been making jewelry this week, getting ready for Open Studios at Porter Mill this weekend. I was short on time today, but managed to make a pair of earrings. 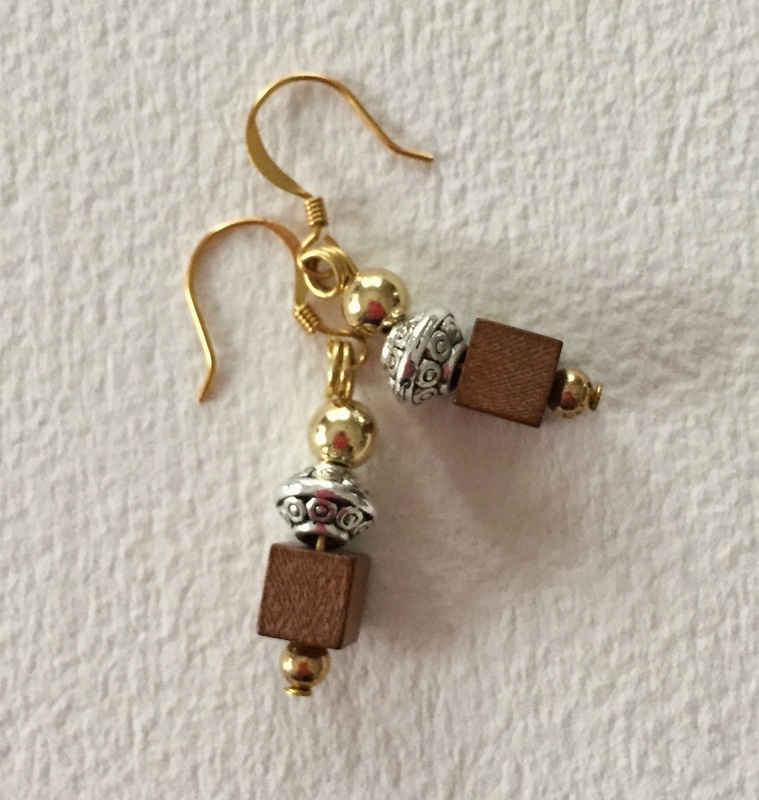 I love these little wooden cubes and thought they would look good with silver and gold. I have been making jewelry all week. 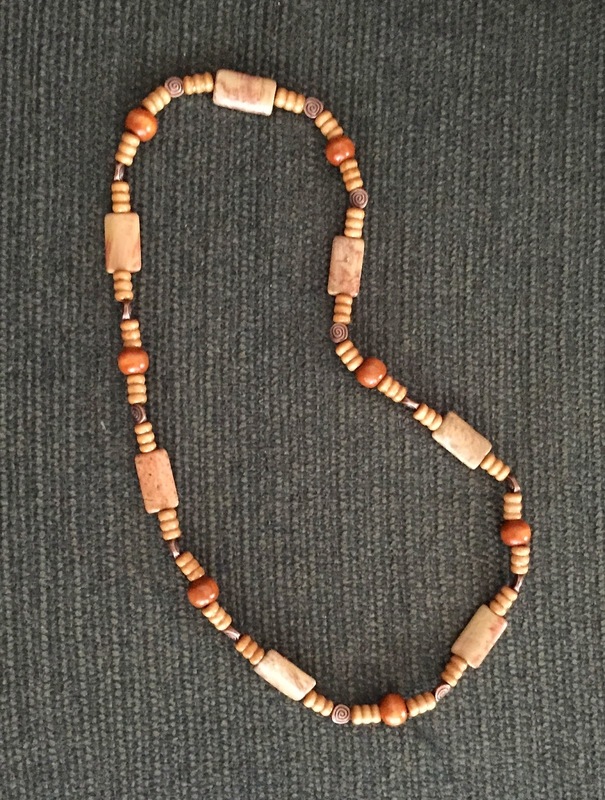 This morning I finished the necklace I started yesterday. This is incised purple glass with glass seed beads and gold and silver accents. This is strung on a stretchy cord, so there is no need for a clasp. This is a necklace I started this morning, but it is still a work in progress. 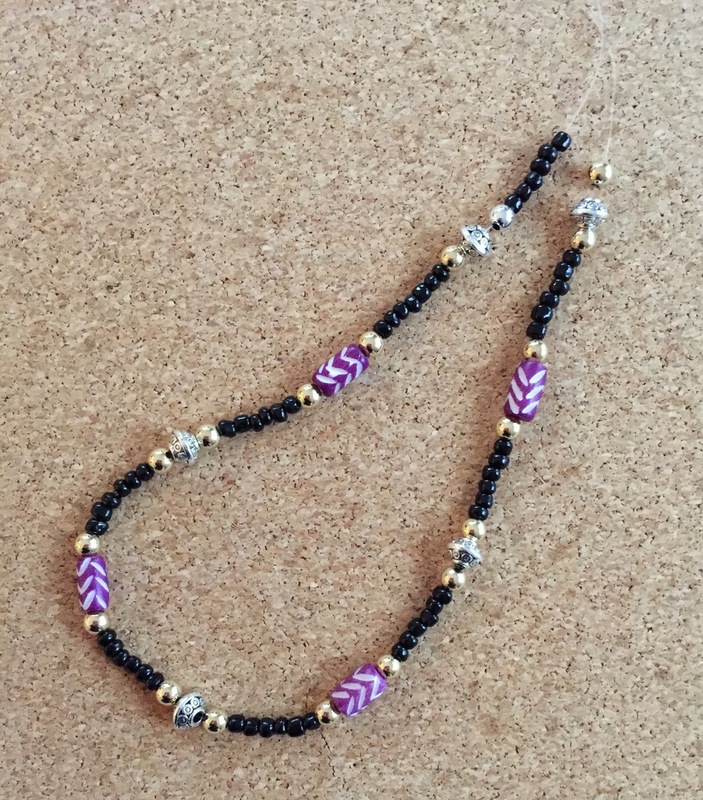 I started with the purple beads incised with a white chevron pattern, and then added the gold metallic beads. 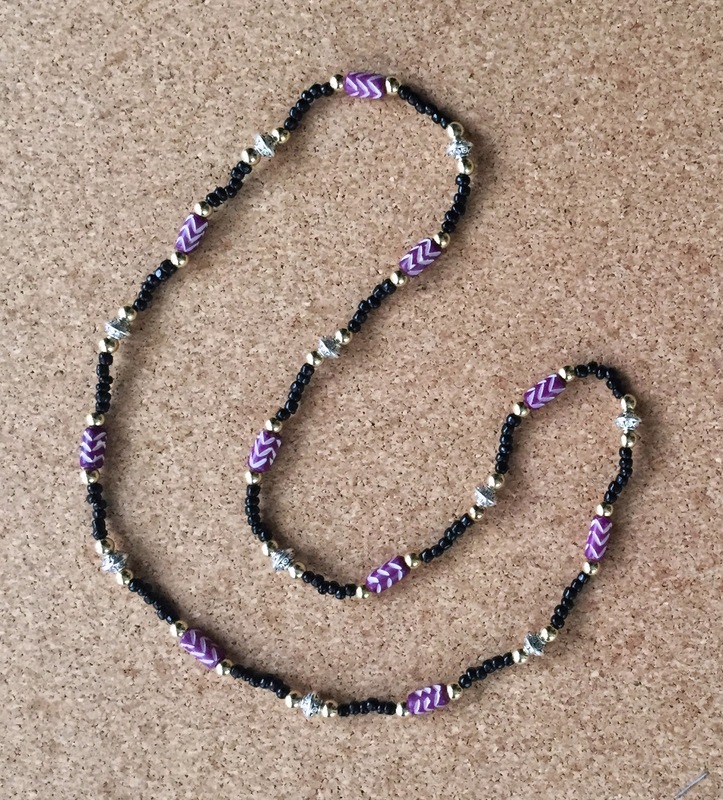 I decided to make the second sequence with the same gold beads and incised silver beads, and then added the seed beads in black glass. I think the design is what I want, but I didn't have time to finish stringing the beads. I hope to finish tomorrow. I made another necklace this morning and the design came together quickly. I combined the wooden cubes with some stone beads and I liked the colors and shapes together. 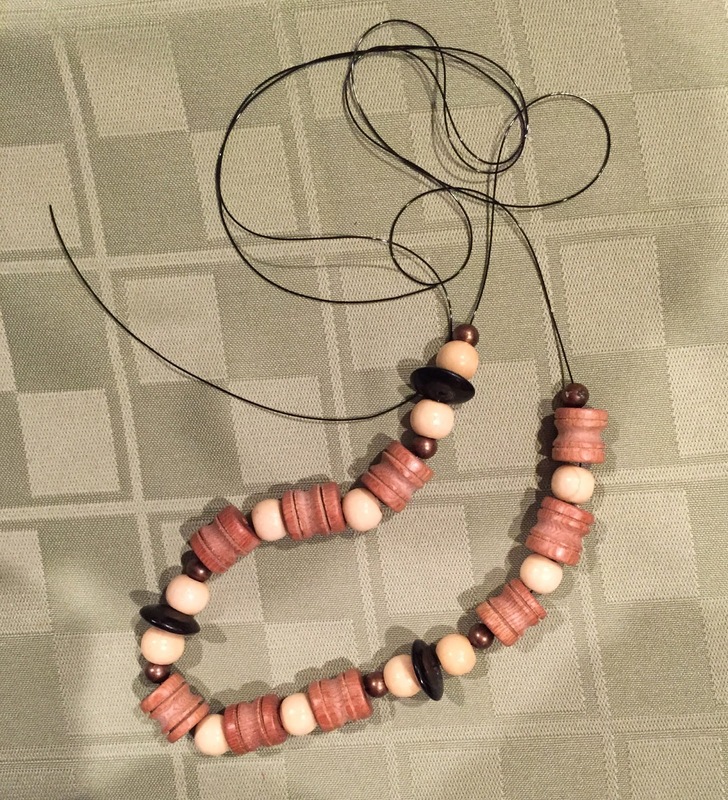 I bought these beads a while ago and am not sure what they are. If there was a label, I can't find it. But I did a little searching on line and think they probably are moss agate, maybe Montana moss agate because of the soft rose color. Anyway, I was happy with combination of the spheres and cubes, but I wanted to accent the black markings in the stones, so I added black seed beads (glass). This is strung on a stretchy cord, so there is no clasp. I made this necklace this morning. The design came together quickly and easily (which is not always the case). I started with the rectangular jasper rectangular, then added the wood and the copper accents. I like to combine semi-precious stones with wood. This is strung on a stretchy cord, so there is no clasp. I started working on this necklace yesterday and finished it today. Yesterday I created two patterns but the necklace wasnt long enough. So to add length, I created a third component, using some copper beads with a swirl design. Now it is long enough. This is strung on a stretchy cord so no clasp is needed. I started working on this necklace today but didn't have time to finish it. So far I have two sequences of bead patterns that I like. I obviously need to add to this to get more length. I couldn't decide how to proceed so I stopped for the day. Of course as soon as I had cleaned up and put things away, I got an idea. But it will have to wait until tomorrow. I started this necklace yesterday, worked on it this morning, and finished it off tonight. The green square beads are Chinese chrysoprase and I combined them with small turquoise cubes, wooden beads, and black seed beads. They are strung on a stretchy cord and there is no clasp. This image began with a photo that I took last week, Thursday morning (Thanksgiving). It had snowed the day before. I saw this view when I looked out my window. 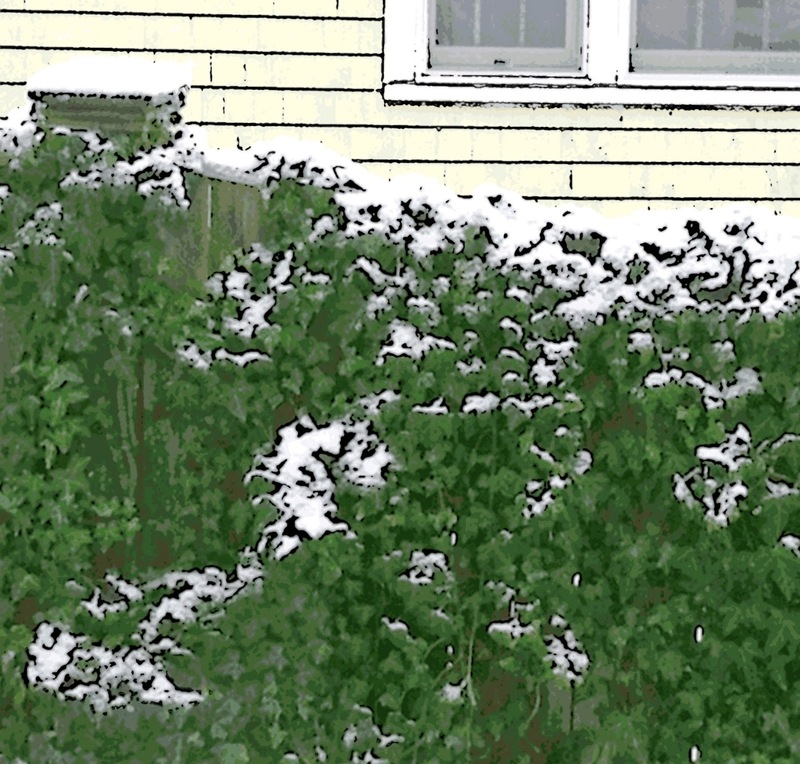 I liked the combination of snow, ivy, wooden fence, and yellow shingles, so I took a few pictures. Tonight I used the best photo to create this image by applying the woodcut effect in Painter. I have been working on this necklace over the past week and I finished it today. 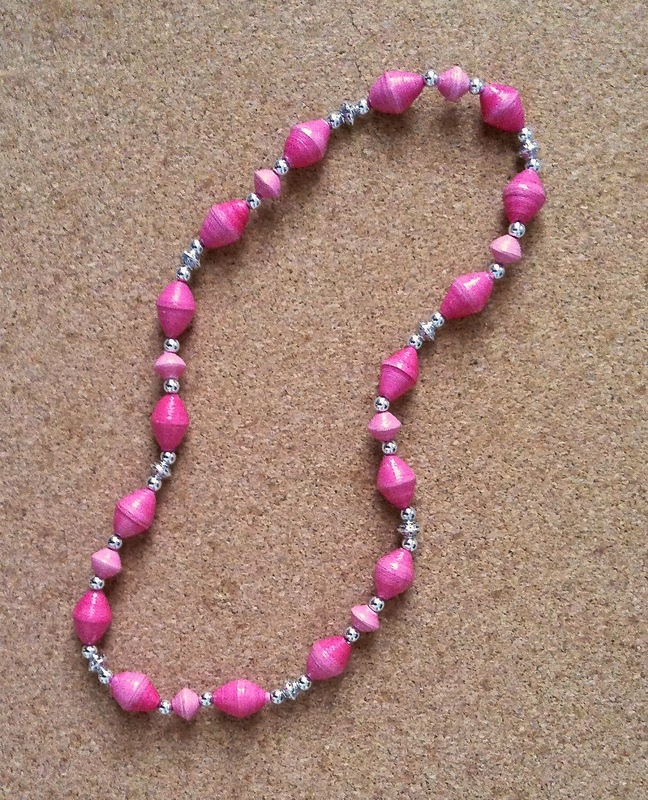 I bought the pink beads in October when I was at the Topsfield Fair with my daughter. 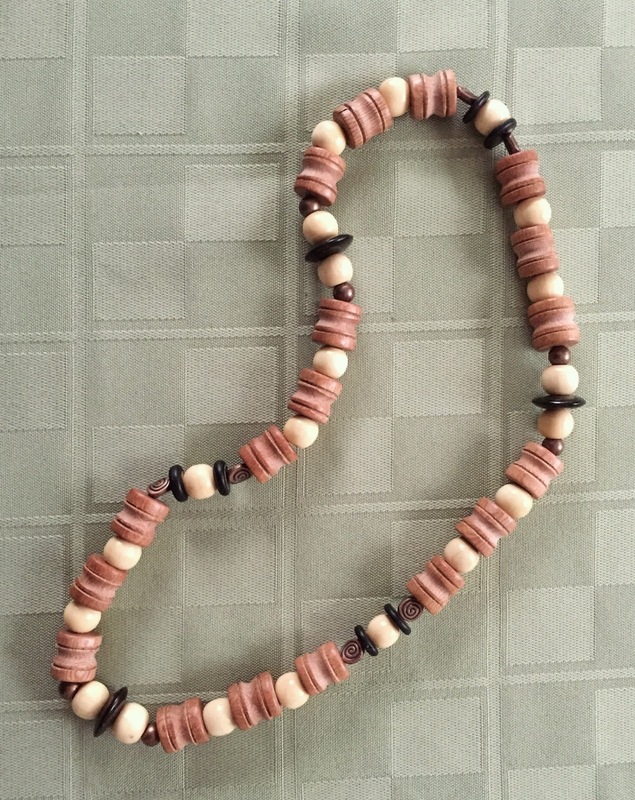 These are paper beads handmade by women in Uganda by an organization called Child Voice. * I bought two bags full of the paper beads, in every color. Then my daughter called my attention to a big bag of pink beads, so I decided to buy them as well. 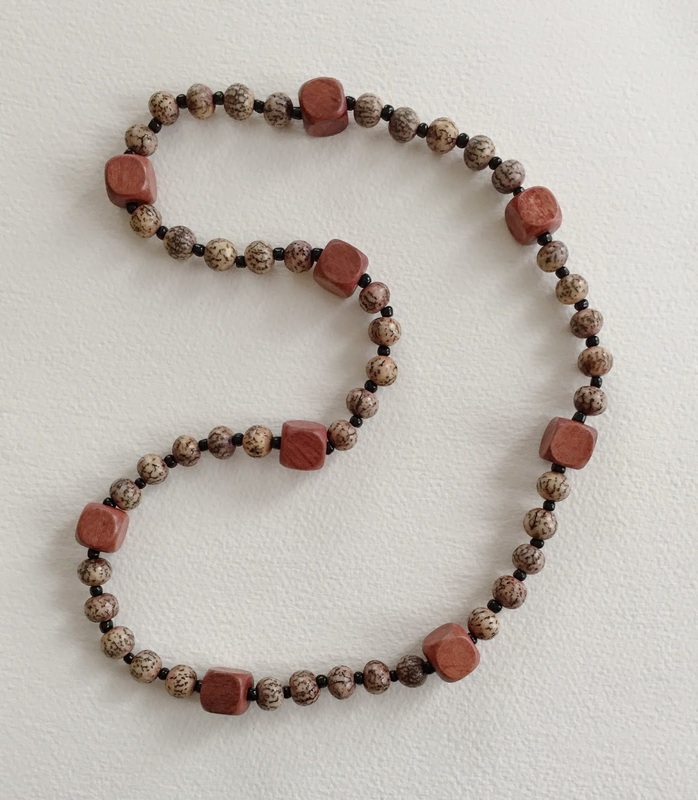 This design combines the pink beads in two shapes with silver spheres and plated silver beads with incised designs. I made this necklace as a gift for my daughter and gave it to her tonight. *If you want to know more about Child Voice, go to this link: childvoiceintl.org. I will just say here that the beads are made with recycled paper and that Child Voice carries the seal of the Fair Labor Association. Our little dog Josie died a few days ago, on Thanksgiving, so last week I created a digital woodcut from a photo that I had taken of her. Today I decided to do another digital woodcut, this time for Perky, her playmate and partner in crime, who died several years ago. I used Painter to simplify the background a bit, and then applied the woodcut effect, using trial and error to get the look I was after.